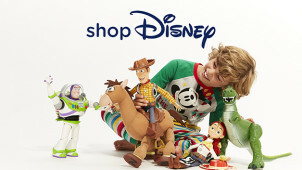 10% Student Discount at shopDisney Students shop online now and save 10% at shopDisney! Beach Towels - 1 for £15, 2 for £25 or 3 for £30 at shopDisney From Spiderman to Moana, get a beach towel with your favourite character on so you can hit the beach this summer! 30% Off Mad Beauty Orders at shopDisney Stock up on your favourite Mad Beauty products at shopDisney and get 30% off! 20% Off Mary Poppins Orders at shopDisney Stock up on the best Mary Poppins goodies with 20% off at shopDisney! T-Shirts - 1 for £10, 2 for £16 or 3 for £20 at shopDisney Splash out on one, two or even three Disney t-shirts for a great deal! 20% Off Selected Toys for Easter at shopDisney Everything you could need to keep the kids quiet this Easter break with 20% off toys at shopDisney! Tiny Big Feet - 2 for £18, 3 for £10 or 4 for £12 at shopDisney Explore Disney's favourite characters and bring the magical gang into your home with this great deal on Tiny Big Feet! 20% Off Dynamic Duos Orders at shopDisney Timon and Pumbaa, Cogsworth and Lumiere - the best of Disney's dynamic duos, now with 20% off! Up to 50% Off in the Spring Sale at shopDisney Don't miss the amazing discounts to be had when shopping the sale at shopDisney! Classic Dolls - 2 for £20 or 3 for £28 at shopDisney Elsa, Anna, Moana - the whole gang is here and with a great offer! The ShopDisney Store is magical, home to genuine and authentic toys, from old favourite princesses to new heroes and villains such a Kylo Ren from Star Wars and Marvel’s Captain America - shopDisney has all they could ever wish for. You can browse by characters like Elsa and Anna, Mickey, Woody, Disney Princesses or Pixar Cars to find the ultimate little piece of Disney, or look through the extensive variety of products on offer, including collectables for adults too! Limited edition boxsets and souvenirs are also great to keep an eye out for – it’s always nice to have a little piece of history. Play make-believe with fancy dress outfits for all your favourite characters and whether they want to be Tinkerbell, Pocahontas, Spiderman or Woody for the day, you'll be able to let them unleash their imagination! The story doesn’t end there, follow the ShopDisney online to keep up-to-date with events at stores near you. You can buy tickets for once-in-a-lifetime shows too such as the enchanting Disney on Ice show, Aladdin on the West End, The Lion King West End Theatre tickets and so much more. For authentic, fun and magical tales, the only place to go is shopDisney! How do I use my Disney Store promotion code? View your savings in the ‘Discount Total’ section of the order summary and click ‘Begin Checkout’ to continue with the payment process, enjoying your Disney Store discounts! Buy a treat for your little one for less from the Special Offers page on the shopDisney online store! Where is the nearest shopDisney store? You’ll find magical places all across the nation, just use the shopDisney store locator online to find your closest store with shelves stacked high with the happy faces of all their favourite characters. How do I get shopDisney free delivery? To save even more on your order, look out for a shopDisney free delivery code at vouchercloud! You can enter your voucher at the online checkout to get your purchases delivered for free. Just check the terms and minimum spend of the voucher and enjoy your savings! What is shopDisney's returns policy? To return an item that you bought from the shopDisney, complete the returns section of the delivery note that was sent with your products, re-package the products securely and include the delivery note inside before sending the package back to shopDisney via the post. Next Working Day Delivery is £5.95 - order by 4pm. DVD and Blu-Ray only orders cost £1 for delivery. Bring the magic of Disney into your home with its iconic characters, toys and gifts all available at shopDisney. Spoiling the children doesn’t have to leave you out of pocket, just pick up a Disney Store discount code to open the doors to the fantasy land of make believe. Shop online today to find their very favourite characters on everything from toys to dressing-up costumes, lunchboxes to socks! Ask for free personalisation at shopDisney to make gifts even more special! See the twinkle in their eye when you present your little ones with personalised toy or gift with their name on it. Use a Disney Store discount code to save on everything from engraving to embroidery, and let the folk at Disney work their magic. Great for kids and adults alike, a personalised something makes for the perfect surprise! You can really get your little ones into character with shopDisney clothing. Make the weekends and that Disney holiday extra special this year with Minnie and Mickey Mouse legging sets or jackets, while you'll find Marvel goods and Pixar pjs galore too. A Disney Store promo code will let you save on some of the most adorable outfits. With clothing for babies and older kids alike, the whole family can really get into the spirit of Disney!